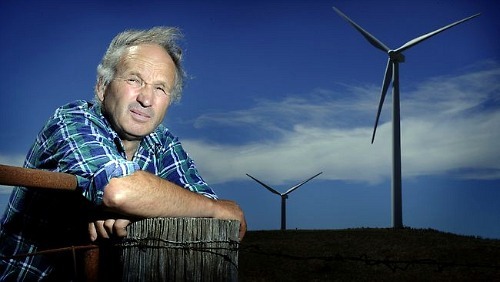 Spanish multinational energy company Acciona has been quietly buying farms adjacent to its site at Waubra, near Ballarat, as an increasing number of residents in the tight-knit community complain of the ill-effects of living near turbines. Since the wind farm started operating in July 2009, about 11 houses in the area have been vacated by people complaining of noise problems. Acciona has bought at least another seven houses, the purchase of two of which appear to have been prompted by the new State Government’s threat to shut down the farm unless noise and permit conditions were met. Locals in the tiny town of 700, 35km northwest of Ballarat, say the sales took place on the proviso landowners would not talk about the price of the purchase or negative health effects they blame on the wind farm. Residents who refuse to move have accused the company of trying to buy their way out of trouble. Noel Dean and other residents believe the Waubra wind farms have caused medical problems. “The word is they’re buying everyone out and buying some of the other properties nearby just to hush them up,” he said. “They know that we can’t fight them. We can’t win. Mr Dean refuses to sell his property because he does not want future generations to suffer like his family. He only returns to the farm when he has to — about once a fortnight — and says every time he does he gets head pain within five minutes that takes up to 10 days to go away. Doctors’ certificates seen by the Sunday Herald Sun back his claims. He has met the company to discuss his concerns, but said they would only take statements, not answer his questions. “I said ‘I don’t want you to buy me out. I want you to fix the problem’,” he said. “It’s hell on Earth living out there. That’s what it is. “And there’s nothing we can do about it. It’s a bloody terrible thing. Former National Trust chairman Randall Bell, now president of Victorian Landscape Guardians, said wind farm companies had a reputation for pulling out their chequebooks to make a problem go away. “What they do is make people sign gag agreements which dictate that they can’t speak about the sales or their health,” he said. Acciona generation director Brett Wickham said there was no proof wind farms affected people’s health, and the plant, which employed about 70 people, was generally well accepted. He said the most recent two houses bought by Acciona were purchased in September and October last year, when noise levels detected on the property were in breach of the company’s planning permit. And he said confidentiality contracts used by the company were “standard practice for the industry“. “Most of the landowners have actually sought confidentiality agreements as well,” he said. But Karl Stepnell, who moved his wife and three children out of Waubra after sleepless nights, heart palpitations, ear pressure and nausea that began when the turbines started turning, disagreed. “They have bought a lot more houses than seven. There are empty houses all over the place,” he said. Planning Minister Matthew Guy, who has the power to shut down the wind farm if it does not comply with its permit, said the Government was watching closely to ensure that wind farm operators played by the rules. “If they are not complying with their planning permit, I would close it down,” he said. A Senate inquiry into the possible adverse impacts of wind farms will be held later this year. I can’t imagine, with all the lawyers in this world looking for litigation opportunities, that one hasn’t realized that the potential for treating sound emitting turbines as weapons, dangerous/deadly, and, with all the health issues, potential witnesses—that one hasn’t taken the matter before the World Court, “class-action” the entire industry into bankruptcy due to accidental, intentional, or misuse of a deadly weapon, and require governments to classify these things accordingly. Editor’s two cents’ worth: I’ve been watching wind energy (WTS and property value) court cases closely, for years. In many countries. The record is dismal. Discouraging. There have been notably few legal successes. Where they have occurred, they have been over-turned by a higher court. As I examine these cases, it appears that the health issue never really gains traction, because the protocols of legal maneuvering and “what constitutes evidence” prevent it from gaining traction. With property value, it comes down to a “he says” versus “she says” deadlock. Yeah, it’s a religion: not amenable to empirical evidence. Read all the editorials on this site by Eric Bibler and you will see my point. Bibler keeps insisting on empirical evidence, and he gets almost nowhere with his pro-wind audience, because they’re playing by a different epistemology. (Forgive me for using a fifty dollar word, but it’s appropriate. It means, roughly, “theory of knowledge” or “principles of knowledge” or “what constitutes legitimate knowledge.”) Big Wind is not part of the realm of rational or empirical discourse; it belongs more properly within the realm of wishful thinking. “Belief.” The Easter Bunny. Fairy gold. Basically, it’s a faith-based initiative, like witchcraft trials of old. And that faith has swallowed the courts. As I said, my two cents’ worth.